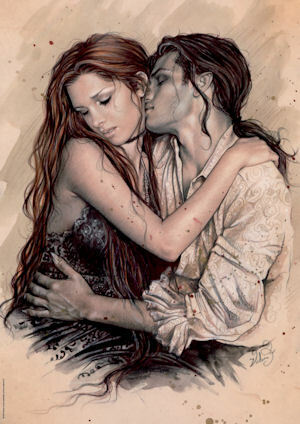 CLEARANCE JIGSAW PUZZLES: Victoria Francis: Embrace. The Spanish artist Victoria Frances' evocative, expressive paintings, depict stories in the Gothic Romantic style. Characterised by desolate and melancholic atmospheres, her work is hugely popular around the world, and each piece translates into a wonderful jigsaw. 1000 pieces. Finished size 68 x 48 cms.